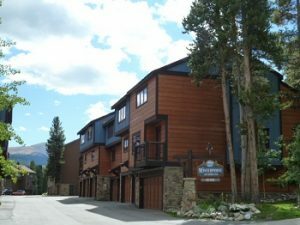 Winterpoint Townhomes are great multi-level townhomes in Breckenridge CO Real Estate. Built in 1979 and 1981 Winterpoint Townhomes can be found off of Four O’Clock Road and Primrose Path. These Breckenridge townhomes are one block to the Snowflake Lift, across the street from the Four O’Clock Run ski trail and two blocks to town for shopping and dining. Winterpoint Townhomes are ideally located with easy access to skiing, Breckenridge’s Main Street and steps from the bus stop. There are a total of 47 Winterpoint Townhomes, comprised of 1, 2 and 3 bedroom units. There are two – 1 bedrooms with 416 square feet, 31 – 2 bedrooms with 1,276 square feet with a 1-car attached garage and 14 – 3 bedrooms ranging in size from 1,339 – 1,792 square feet with attached 2-car garages. Winterpoint Townhomes are a part of the Upper Village Homeowners Association which gives owners and guests use of the Upper Village pool and hot tubs a couple blocks away. If you are looking for larger in-town Breckenridge townhomes take a look at Winterpoint Towhomes. For questions regarding Winterpoint Townhomes or all other Breckenridge Real Estate, call Justin and Krystal Knott at 970.333.9050 or inquire online.